Lee Bermejo take’s a unique and entertaining approach with his new representation of Charles Dickens A Christmas Carol. With Batman as Scrooge, this graphic novel puts a fun twist on this holiday classic for the holidays. 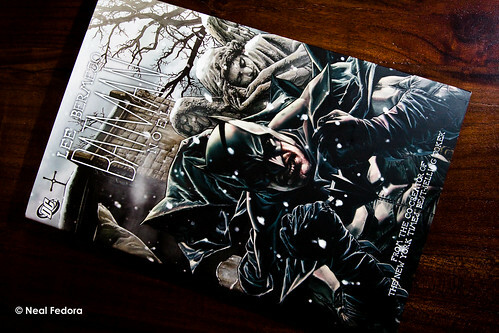 The artist and author of Batman Noël was Lee Bermejo who masterfully ties Batman with Scrooge for this holiday remake. Jim Lee wrote a wonderful introduction to this twisted holiday classic praising Lee Bermejo’s growth and ingenuity. I haven’t heard of Jim Lee since his Wildcats days at Image Comics, so it was a welcomed blast to the past. I always enjoyed his work. Visited by his late partner Robin, in place of Jacob Marley, Batman is told that he will have three “visitors”. The Ghost of Christmas Past takes the lovely form of Catwoman, reminding Batman of the good o’l days of playing cat and mouse. Superman then visits Batman as the Ghost of Christmas Present showing him that there are more to people than just pawns in his game to capture the Joker and that Batman isn’t as beloved as he thought because of the person he has become. Finally, the Ghost of Christmas Future, the Joker, visits Batman and shows him that life could and will go on without him.. I got to say, Lee did an amazing job using the symbolism of the Ghost of Christmas Future for the Joker. Lettering by the best in the business Todd Klein and the wonderful, dark, rich coloring by fellow Italian Barbara Ciardo, Lee Bermejo surrounded himself by a fantastic team for his first solo project. I got to say, it was a really fun read and one that will make a great Christmas gift for my nephew. 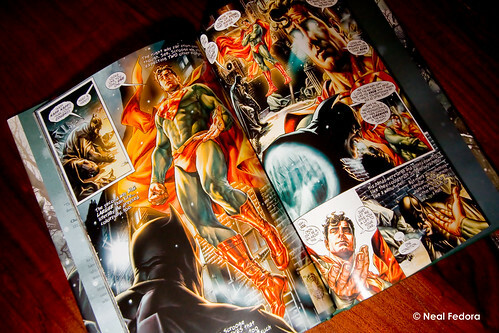 For a preview of the graphic novel, check out DC Comics. For more thorough reviews, check out USA Today, IGN and fellow WordPress blog Dark Media City.